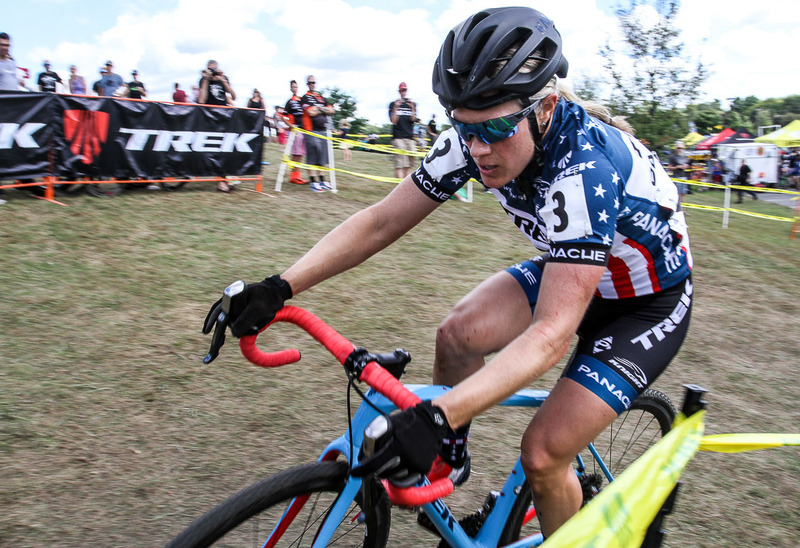 The first day of racing at the 2016 Trek CXC Cup was a showcase for cyclocross powerhouse continents, with American women swarming the front of the women’s race, and European men hoarding the first seven spots in the men’s race. Full report and results from Saturday’s UCI C2 race below. 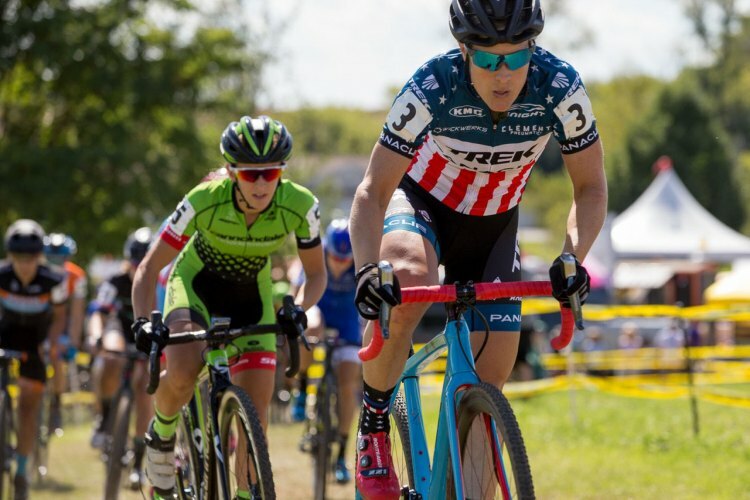 Katie Compton (USA) of KFC Racing p/b Trek/Panache was on form for her first cyclocross competition of the season, winning the UCI Elite Women’s C2 race at Trek CXC Cup in Waterloo, Wisconsin. She won in a time of 47:41, 36 seconds ahead of Ellen Noble (USA) of Aspire Racing. 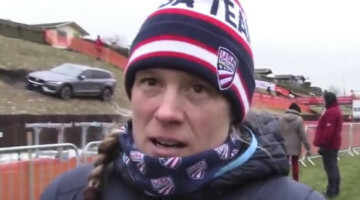 Amanda Miller (USA) of Boulder Cycle Sport/Yoga Glo was third, 1 minute 17 seconds behind the reigning USA Cycling National Cyclocross Elite women’s champion. 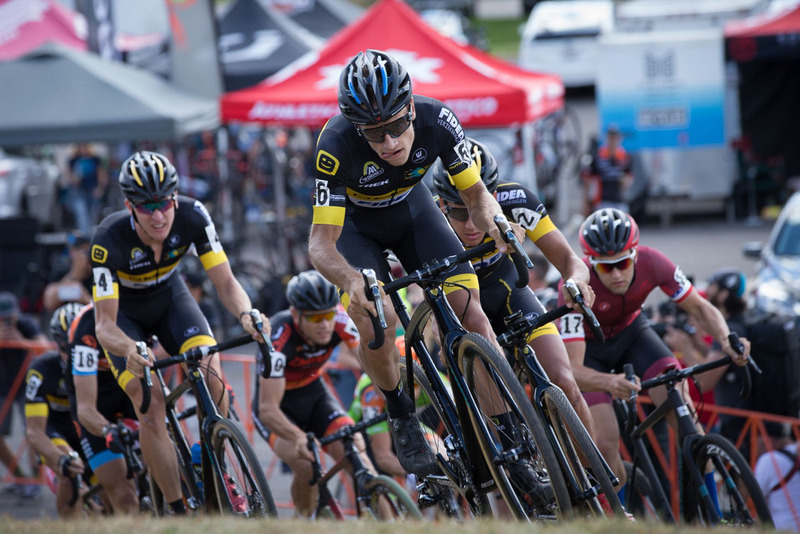 The Trek CXC Cup is the second of eight events for USA Cycling’s Professional Cyclocross Calendar (Pro CX) in the country for 2016-17. Equal prize money is offered for men and women in the elite categories both days. The course was redesigned from last year with a flyover, a new Elite racer-only hill climb, and a new Elite downhill in the woods. Noble took a brief lead on the second lap from eight riders. Then it was all Compton. Ellen Van Loy (Belgium) of Telenet-Fidea finished fourth in today’s race. 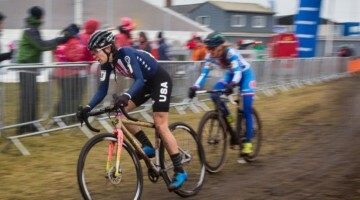 Wisconsin native Katie Antonneau of Cannondale Cyclocrossworld finished eighth. Noble made big improvements from her C2 race at Rochester Cyclocross last Sunday, finishing 11th today. Last week in Rochester Miller did not finish the C2 race, but did finish second in the C1 event. Tomorrow the UCI C1 Elite Women’s race at Trek CXC Cup will be held at Noon (CT), with Elite Men’s race to follow. 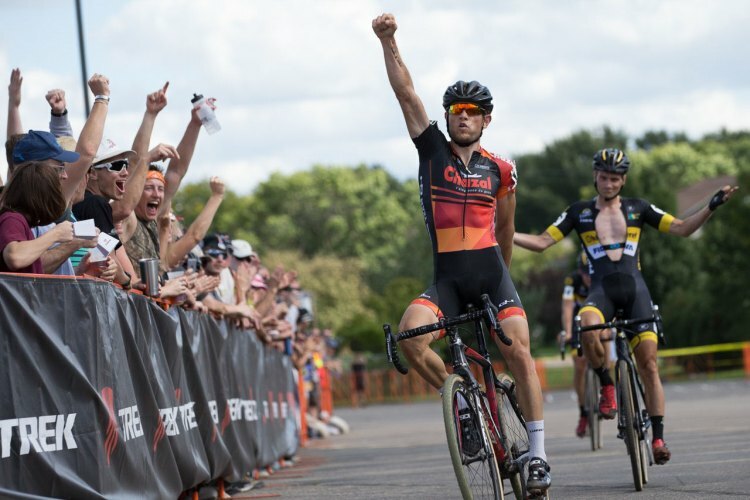 Former pro road cyclist Steve Chainel (France) of Cross Team by G4 started his first Pro CX race with a herculean effort by winning the UCI Elite Men’s C2 event at the Trek CXC Cup on Saturday. He outsprinted Jim Aernouts (Belgium) of Telenet-Fidea for the victory in a time of 1:02:11. Third place was taken by Toon Aerts (Belgium) of Telenet-Fidea, eight seconds back. 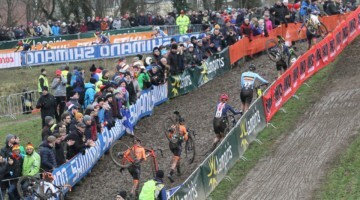 The two Belgians were joined at the finish by three other teammates, Corne Van Kessel (Netherlands), Quinten Hermans (Belgium) and Daan Soete (Belgium), who rounded out the top five, respectively. The top American was Tobin Ortenblad of Santa Cruz Factory Racing, a former U23 national champion, finished in eighth position, with Canadian Michael van den Ham (Trek – Red Truck) in ninth. American Danny Summerhill of Maxxis – Shimano continued to have bad luck this weekend. He flatted in the C1 race in Rochester last weekend to finish at the back of the field. Today, he dropped the chain at the start of the C2 race and battled his way back through the field of 44 riders to finish 17th. Saturday’s surprise winner sustained attacks from a full team of Telenet-Fidea riders, coming back time after time to regain the lead. “I wanted to go on the podium, that was my tactic today. I wait, I wait. The last lap, with 500 meters to the finish, I attacked and directly I get the wheel to sprint. My legs [were] out, but in my head I want to win this race. I am so happy,” said the Frenchman, who competed nine years in road racing, most recently for Cofidis and AG2R La Mondiale. “So now I want to be a cyclocross man. I start my new season with the best stuff. When I am in Europe I watch all the Belgium races on the internet. They are the best riders in the world. It’s a nice opportunity to come to the U.S. to run with the big guys. Tactically it was so hard. It’s amazing for me,” added the 33-year-old Chainel. 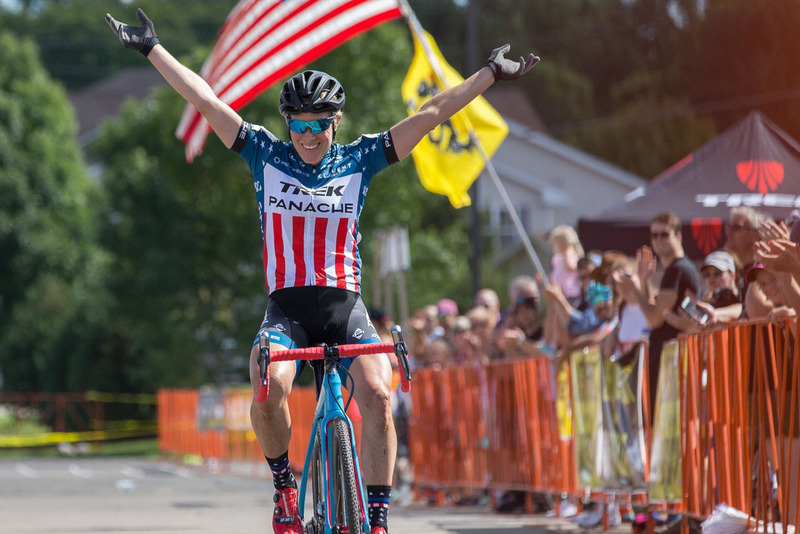 Next on the calendar will be Jingle Cross in Iowa City, Iowa, Sept. 24-26. This year Jingle Cross will host the Volkswagen UCI Elite C1 and C2 races on Friday and Sunday, and the Telenet UCI Cyclocross World Cup races for Elite men and women will be on Saturday. Full results below. Photo gallery below the results. Check back more for video interviews and for Day 2 coverage. 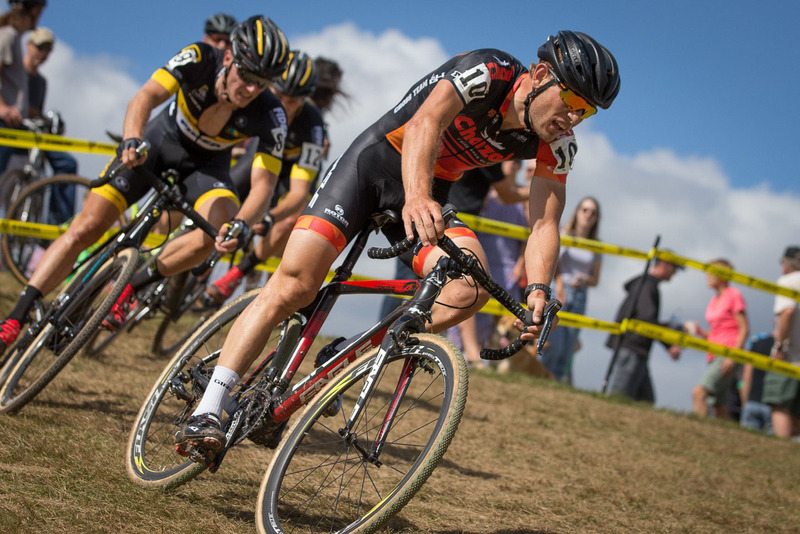 For more details on Trek CXC Cup visit trekcxccup.com. 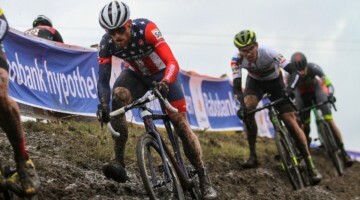 To learn more about USA Cycling, visit usacycling.org, and follow Pro CX all season on Twitter – @USACProCX. MrKatieCompton KatieFnCompton that’s the official results sheet, so def.let usacycling know, but we’ll make the change! Two thumbs up for #trekbikes for the live coverage. Fantastic feed. The commentary, not so much. “Wattage Cottage”, really? You don’t have to talk over the entire race. A few pauses for silence would be nice.